Great Dunham is a small parish in the centre of Norfolk. It lies on the top of a flat-topped hill and is part of the Breckland administrative district. The village gets its name from its location. The name Dunham derives from Old English and means 'hill farmstead'. The village is recorded in the Domesday Book in 1086 when it was an outlier of the manor of Mileham. At this time there seems to be no separation of Great and Little Dunham although the two villages are now separate parishes. The Domesday Book and the Old English derivation of the name both suggest that the village was settled in the Saxon period. There is, however, plentiful archaeological evidence for settlement here earlier than this. The earliest find from the parish is an Upper Palaeolithic or Mesolithic flint blade (NHER 36995). Flint tools were used throughout the prehistoric period and worked flints have been found at several sites. During the prehistoric period flints were also burnt. Heaps of these prehistoric burnt flints called burnt mounds (NHER 4081, 31616 and 31830) have been recorded. Unfortunately it is not really clear what these heaps of burnt stones were used for. Early Neolithic flint cores and scrapers (NHER 40916) have been recovered from one site. Although they are not plentiful enough to indicate settlement or flint knapping they do suggest there was activity in the area at this time. Other indicators of activity including several Neolithic axeheads (NHER 4075, 4170 and 4171) and a Neolithic flint arrowhead (NHER 4167) have been found. A stone macehead (NHER 14987) found in the village may date to the Neolithic or the Early Bronze Age period. Another Bronze Age find from the area is a copper alloy palstave (NHER 4173). Interestingly this was found and reported as early as 1782. A Bronze Age awl has also been recovered. Although there are fewer metal finds dating to the Iron Age there are several significant pottery scatters (NHER 36576 and NHER 38082) from the area. Excavation at one of these sites uncovered an Iron Age ditch (NHER 37163) containing large fragments of Late Iron Age pottery. At other locations prehistoric pottery (NHER 4196 and 31829) of less clear date has also been found. Although there is no clear evidence for settlement in the prehistoric period it is obvious that there was activity. Many of the Roman sites discussed below also had Iron Age material found at or near them and this suggests that some of these may also have been inhabited in the Late Iron Age. Several areas of Roman settlement (NHER 4188, 21441 and 36994) have been identified. The large amounts of material collected from these sites by metal detecting and fieldwalking suggests these were areas where people were living. At one of these settlement sites (NHER 4188) a Roman vessel mount in the shape of a mask was recovered. The proximity of the Fen Causeway (NHER 2796), an important Roman road, may explain the presence of these settlements. At one of these sites (NHER 4188) many lumps of silver and copper alloy metalworking waste were found. This might suggest that this area was used for metal recycling and the production of new items. At a second site (NHER 21441) a geophysical survey has identified a corridored building. This is thought to be a villa. At the third site (NHER 36994) a Roman military diploma was recovered. This inscribed lead tablet was given to Roman soldiers after twenty five years service and granted them Roman citizenship. It is a very unusual find. Even more strangely two pieces of the diploma have been found on separate occasions in the same field. The lead tablet found in Great Dunham belonged to a man who was recruited into the Roman army in Pannonia, eastern Europe. It seems he decided to settle down in Norfolk after he retired. Other scatters of Roman pottery have also been identified (NHER 4176, 12068 and 31201). One of these was found with parts of an ironworking furnace that had been destroyed by the plough. Investigation of the field by geophysical survey identified that this furnace was within a much larger, probably Roman, rectangular enclosure. A road passed through the enclosure and slight traces of buildings and other features associated with ironworking could be seen. More evidence of Roman settlement is seen in the walls of the parish church. Many Roman bricks were used to construct the 11th century church of St Andrew (NHER 4178). There is lots of evidence for Roman Great Dunham. Unfortunately there is very little to suggest where people were living and working during the Saxon period. At one site an Early Saxon brooch and girdle hanger (NHER 36994) were found together. 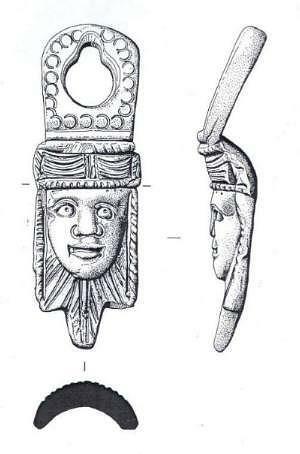 Elsewhere an Early Saxon pendant and bridle cheek piece (NHER 4188) were recovered. At a third site fragments of Early Saxon pottery (NHER 4196) were found. None of these finds, however, can be considered evidence for occupation. There is also scanty evidence for the Middle Saxon period. Middle Saxon pottery (NHER 4196) has been found and an exquisite Middle Saxon hanging bowl escutcheon (NHER 21441) in the form of a bird with folded wings has also been recovered. It isn't until the end of the Late Saxon period, when the church of St Andrew (NHER 4178) is built, that we can be certain where people were living. Late Saxon pottery fragments (NHER 31201) and a Late Saxon silver belt slide (NHER 31580) have also been found. The 11th century church of St Andrew's (NHER 4178) appears to have been relatively unchanged since its construction although the chancel was heavily renovated in the 19th century. In the medieval period there was a second church in the village. St Mary's (NHER 4200) had its own rector until 1437. It isn't clear when the building was demolished but there is no sign of it now. Parts of the large limestone blocks used to build the church are thought to have been used in the construction of Croft Farm (NHER 13021) and Rookery Farm (NHER 13022) and may also have been used to build Dunham Hall (NHER 13726). This medieval building no longer survives but was famed for its stained glass before it was knocked down in 1800. The outline of the walls and interior layout can be seen on aerial photographs. Earthworks of another abandoned building, although less grand, can be seen on aerial photographs. The remains of a medieval farmstead (NHER 4194) can also be seen on the ground and some flint and brick masonry survives. 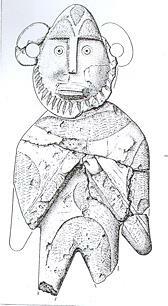 A carved alabaster figure of a knight (NHER 48961) found in the parish probably dates to the 12th century. 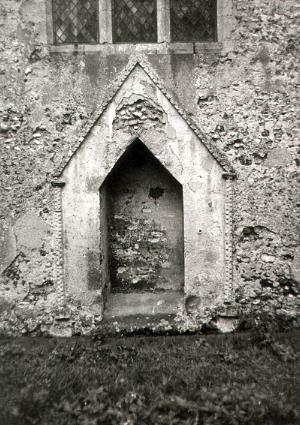 The destruction of St Mary's provided some rich building material that was used in local houses. An 18th century brick cottage Croft Farm (NHER 13021) has reused blocks including window traceries in its gable ends and parts of 17th or 18th century Rookery Farm (NHER 13022) and its outbuildings, including a piggery and a folly, made use of ornate bits of stonework. 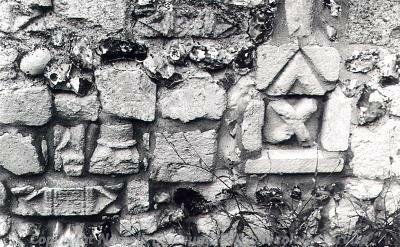 These may have come from St Mary's or Castle Acre Priory. Great Dunham windmill (NHER 4201) started life as a smock mill but was later replaced by a tower mill. This was used until 1916. Surprisingly the village seems to have been relatively untouched by both World Wars and there is no archaeological evidence recorded from the modern period. Megan Dennis (NLA), 6 January 2006.
http://www.norfolkchurches.co.uk/greatdunham/greatdunham.htm. Accessed 6 January 2006.
http://www.norfolkmills.co.uk/Windmills/gt-dunham-towermill.html. Accessed 6 January 2006.